The Flinn home was situated in that part of Tennessee that lies between the Mississippi and the Tennessee Rivers, which meant that they were within a 75 mile radius of the main battles which Grant waged in that section of the state. On February 6, 1862, after hard fighting, Fort Henry (on the Tennessee River) fell into Union hands. Ten days later, and twelve miles to the east, Fort Donelson (on the Cumberland River) suffered a like fate. General Albert Sidney Johnston, the Confederate General, had to abandon his northernmost posts at Columbus, Kentucky, (on the Mississippi River) and his headquarters at Nashville, Tennessee (on the Cumberland river). The way was opened for a Union invasion of western Tennessee. These first battles were fought to the north of the Flinn home; the next big one was fought to the south. Pittsburgh Landing was on the west side of a sharp bend in the Tennessee River and twenty miles northeast of Corinth, Mississippi. In the year 1862, Pittsburgh Landing was no more than a steamboat wharf, a log house, with a steep bluff rising behind them. Back in the woods, about three miles from the landing, there was a little Methodist meeting house called Shiloh Church. The spot sounds peaceful enough but it was here that one of the bloodiest battles of the Civil War was fought. Forty thousand Union soldiers were encamped between the landing and the church awaiting new recruits, when General Johnston and his Confederates launched a surprise attack upon them in the early morning hours of April 6th, 1862. By nightfall the Yankees were driven to the very bank of the river. 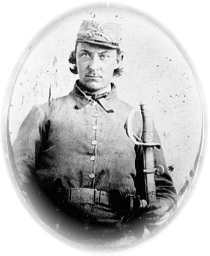 Nevertheless, Confederate morale was considerably shaken due to the fact that General Johnston had lost his life during the day. The Union reinforcements arrived on the scene the next day, and with this added strength they forced the Confederates to make an orderly retreat back to Corinth. The Union soldiers were so battle-scarred that they were unable to pursue the Confederates, and both the North and the South claimed the victory. The battle of Shiloh was fought less than 50 miles from the Flinn home. Casualties were heavy -- 13,000 out of 63,000 Union soldiers died, and 11,000 of 40,000 Confederate troops were killed. The Union army was spread over such a wide area in Western Tennessee and was under so many commands that it weakened their aggressiveness. Nevertheless, they won several more victories in the "river war" including one near Memphis, Tenn., where Grant set up his headquarters. Union soldiers often passed along the road which ran in front of the Flinn home. Like soldiers everywhere, the troops sang songs from morning to night. The Yankee favorite was "John Brown's Body", and it gathered more and more stanzas as the war progressed. One of the more popular stanzas went as follows: We'll hang Jeff Davis to a sour apple as we go marching on." Young Curt Flinn had evidently listened well to his parents discussions and as to whose side of the war the family was partial too as four year olds are prone to do. One day as a group of the Yankees were passing by the Flinns home, Young Curt climbed up on the gate post and taking his cap off , he began to wave it high in the air. He shouted to the top of his lungs: "Hoo-way, for Jeff Davis! Hoo-way, for Jeff Davis!" This little episode struck fear into the hearts of Susan and John, for many a southern home had been ruthlessly destroyed in retaliation for lessor offences. However, the Yankees merely smiled at the child's enthusiasm and kept plodding down the road. The bleak Christmas of 1862 came and went on the following Wednesday, December 31st, a battle was fought near the Flinn home. Susan and John could hear the roar of the cannon and their hearts were heavy. Susan Frances was three months pregnant with her fifth child, Sallie Bet, she had two brothers fighting for the Confederate cause and she was fearful for the safety of all those she held dear. The battle going on so near them was fought at Parkers Cross Roads also called Red Mounds, near Lexington in Henderson County, Tennessee. It was a desperate engagement and Dr. Flinn stocked his saddlebags with such medicine and bandages as he could muster, mounted his horse and rode to the field of battle. There he went among the injured and dying and ministered to Northern and Southern soldier alike. It was on this occasion that he picked up a cannon ball, which still remains in the Flinn family to this day. Susan and the other pioneer women "made-do" with what they had. Clothing was made over until it was too thin to be used for anything except rag; shoes wore out and were replaced by home made wooden soles and crude canvas tops; buttons were lost and couldnt be replaced, so a hole was bored in persimmon seeds and this served as a method to hold up their garments; pins could not be bought, so they used thorns instead; rugs were taken off the floor and made into blankets and even overcoats; crockery and other manufactured articles was unobtainable at any price; knitting needles were half idle because there was a permanent shortage of wool; coffee and spices were not to be had , so the women parched corn and peas and used these (8) in place of coffee. Confiscation by the Yankees of southerner property occurred often although most southerners became adept at hiding food and livestock until the enemy passed by. Many a livestock were hid in the woods and many a basket of potatoes were buried and covered over with leaves during this time. Amazing stories were told of the ruse the southerners used to protect themselves. Women were said to have powered their face to a deathly appearance and then crawl into bed fully clothed and put on an act of excruciating pain when the Yankees appeared. Such apparent suffering softened their hearts to the extent that her house nor she was molested. The people of Western Tennessee weathered the ordeal better than those in more densely populated areas. Even if their money wasnt worth the paper it was printed on, and absolutely no manufactured article could be bought, they were blessed by having a supply of basic food which they grew themselves and supplemented with wild life. Forty four years later Susan told her granddaughter, Effie Dean Rogan, about the happiness she felt when she wore her first new calico dress after the War. Perhaps one of (unclear) the southern women felt was the absence of (unclear) feminine frills. One August day in 1863, Susan was sitting and working on Confederate uniforms. She looked down the road and saw a group of Union soldiers approaching. March 4, 1865 Abraham Lincoln was inaugurated for the second time. April 1865 was a momentous month for both the North and the South. General Lee's troops were soon surrounded, and on April 7, Grant called upon Lee to surrender. On April 9, the two commanders met at Appomattox Courthouse, Virginia, and agreed on the terms of surrender. Lee's men were sent home on parole --soldiers with their horses, and officers with their side arms. All other equipment was surrendered. The Civil War was at an end. April 15, 1865  Abraham Lincoln died from an assassins bullet. The people of the Confederate States of America had hated Lincoln with all the passion that they were capable. They felt he wanted a war and had helped make it. When the news of his death reached them there was a tendency to rejoice rather than to grieve. This attitude stayed with Susan Frances McGuire Flinn all the days of her life, and she never heard Lincoln's name or saw the United States flag without hissing. She stayed an out and out rebel until her death and gave the rebel yell, which was a spine tingling war whoop, whenever Dixie was played. She had lost her beloved brothers in the war, one of who died during an epidemic of measles among the Confederate troops and the other in Calvary service with Lt. Gen. Nathan Bedford (tear). She was not alone in her hatred of the North and the men whom she felt had brought on all the suffering she had observed and felt. It was not until four generations later that the sentiment began to die out, and it was not entirely gone until the fifth generation. In fact it was 1954 before Texas made Lincoln's birthday an official legal holiday. The above information was made available by - Effie Dean Rogan with minor editing by Marvin Schubert. The author is assumed to be Effie Dean. Reconstruction was hard everyone in the South. Many families began looking West ward to rebuild their lives. Much of the materials below where copied from information that Thomas Hance Flinn III provided me. Again some editing was done by myself, Marvin Schubert. Thomas Henry was born in Tennessee in 1865. He attended the old Round Rock Institute. He married Eldora M. Kimmons of Coupland and they had four children, Thomas Hance, May, Luther C., and Owen Renshaw Thomas Hance married Margaret Annie Bowden, daughter of William M. and Ida R. Bowden, and sister of Mrs. Alex Martin, [tear] Thomas Henry was active in Hutto and Williamson County. He served as postmaster, mayor and county clerk from 1904 to 1914. He was engaged in various business enterprises--printing, newspaper publishing, etc. He, his brothers John and Charles and Maggie bought farmland in San Patricio County at the turn of the century and were successful in various farming operations in the area. There are still descendants of the family in the Taft area as well as the Valley and Central Texas. Mary Jane, "Jennie" as she was affectionately called and her husband Charles Wesley Hutto, whose father founded the town of Hutto, had 6 children and raised 4 children to adulthood in Hutto before moving to Kelso Washington abt. 1903. Family members speculated that they moved to Washington during the logging boom. The family bought a city lot in Kelso and continued to live there until this present day with the exception of one son, Hardie Hutto, who moved back to Taft. His Flinn Uncles helped him get started in the farming business. C.W.s body was returned to Hutto for burial in 1919 on his death, but Mary Jane was buried in Kelso Washington. Headstone in old Clover Creek Cemetery one mile south of Medon, Tenn.
Effie Dean Rogan, daughter of Sallie Flinn and Will Rogan, did some research on the Flinn Family. She gave me some letters from Ruby Flinn Petrie, daughter of Will Flinn. In one of the letters Ruby said that a Mr. John H. Love, a genealogist, in Park Ridge, Ill., wrote her for information on the Dr. John Carroll Flinn family. He was hired to locate the heirs entitled to the estate of Will Flinn, John Carroll's nephew. Mr. Love told Ruby the lsiah's father was Jasper who came to America with his brothers William and Frank from Northern Ireland and that they were Protestants. Ruby said "Cousin Felix of Steele, Mo. said Jasper was born and lived near Nashville, in Bedford. Effie Dean said Isiah OFlyn was Isiah's father. I go with Isiah. I have not been able to solve this mystery as of August 1995. John Carroll Flinn was born in Bolivar, Tennessee. He worked for a time for a Teague as a saddle maker. He attended the University of Nashville. 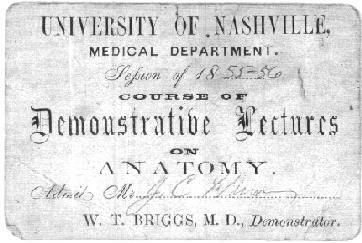 (Now Vanderbilt) I have an admission pass for John C. Flinn to attend Demonstrative Lectures on Anatomy for the Session of 1855 to 1856. He attended the wounded on the battlefield at Shiloh. He was not eligible for military service because he had a club foot. After the war he migrated to Texas arriving in Round Rock on New Years day 1970. According to young Hal Flinn, he was offered 200 acres adjoining the then city of Dallas if he would stay and practice medicine there. His wife wanted to go on to Round Rock where she could be near her Aunt Mattie Blair, sister to her father, James McGuire, who had helped raise her and her sister Mary. He eventually settled on a farm near Shiloh Crossing on Brushy Creek Southeast of where the Town of Hutto would eventually be established. He practiced medicine there until he died. Susan McGuire 's mother's death by lightening at age 10 must have been a tramatic ordeal. Evidently James McGuire was not in a postion to keep his young family intact as the children were placed with relatives. What became of James is not known. Susan went to live with her maternal Grandfather who had remarried. After Grandfather Bailey'sdeath Susan spent time with the Henry Parker family and her Aunt Mat. How much time with each is unclear but Susan held both parties very dear. The Parker family was said to be related by an Aunt. How that relationship exist is unclaer but Susan refered to the Parkers as her relatives and held Dr. David Hardie Parker her cousin 5 yrs senior in high esteem. While considering a trip back to Tennessee at the turn of the century, and learning of David's death, Susan was to have said that she did not wish to return as David was the primary reason she had considered returning. Henry Parker according to family members owned many slaves and had a large plantation in Madison County, Tennessee. Susan had told stories of the slaves waiting on them when she was a child. She shared that after swimming they were attended too and that the servents followed behind she and friends caring thier shoes as they returned home. Aunt, Mattie Blair, who was a sister of James McGuire, along with her husband George Blair had moved to Texas with several of the Blair family in the late 1850s. George and Mat ( Martha ) had no children of thier own and must have been pleased to have helped James with raising his children after thier mothers death in 1847. Evidently Mary, Susan's sister came with the Blairs to live in Round Rock, Texas out side of Austin. Susan was eager to rejoin her Aunt and Sister after the War and John and Susan purposely made thier way to Central Texas to start a new life and to enjoy the benifirts of having relatives within close proximity. Mary, her later married Francis McMordie and raised her own family of 4 near Vernon, Texas. She was a Midwife and nurse for John Carroll. Susan was said to have studied the practice of Medicine from her husband John. She would put her youngest child up on a saddle with her, rain or shine and ride miles by her husbands side to attend to some person who was ill.
Susan and John moved to Hutto, Texas within a short time after arriving in Texas and both lived there until thier deaths. Thomas Henry Flinn was the Administrator of the Estate of his father John Carroll and allowed his mother $24.00 a month living expenses. Not bad in 1900. O.R.Flinn said that she would pack up all her belongings and take a train from Hutto to Georgetown to visit. The children greet their grandmothers arrival with mixed emotions; for two reasons, first they had to tote all her luggage and second, immediately upon arrival she dosed them all with Castor Oil. Thomas Henry left a handwritten dairy which, in short, tells of his arrival in Texas in 1869 after six weeks in a wagon. They landed in old Round Rock on Jan 1, 1870 and soon moved south of where Hutto now stands into a double log house on the grounds where the Swedish Cemetery is now located. In 1871 moved to Gunn(?) farm about halfway between Round Rock and Georgetown and lived in that house for two years. In 1873, his father bought 50 acres eight miles southeast of Hutto and lived there until 1879. His father then bought a tract of land four miles south of Hutto where Thomas Henry lived. He graduated with honors from Round Rock Institute in 1885. In 1886 went to work for Thomas M. Metcalf who had a General Merchandise Store, Post Office and telephone in Hutto. In the summer of 1889, he was forced to resign because of ill health and went to Monterey, Mexico to the Lopochico (?) Springs where he recuperated for over a month. May Flinn said it was thought he had spinal meningitis. He returned home, not able to resume work. In December he began a school at Brushy Chapple school house located about three miles west of Hutto. He boarded with Mr. John A. Harris for $8.00 a month room and board. In the summer of 1890, following the closing of that school, he taught a three month school on the Whettle and Harrell ranch, later known as "the lease", located about four miles northeast of Hutto. He boarded with brother Curt and family. In the winter of 1890 he opened a school at Shiloh, 3 miles southeast of Hutto on the North branch of Brushy Creek and one mile north of his father's farm where he lived. After closing this school in the spring of 1891 he "took charge of Smith Johnson's Drug Store in Round Rock". He consolidated this Drugstore with Dr. J .H. Johnson's Drugstore. He managed the store until June of 1892 when he resigned and went to work with his Brother George in his Drugstore in Hutto. In the fall of 1892 he opened a school at Burnops (?) school where he taught 5 1/2 months, living at his fathers. While engaged with this school he was appointed Postmaster at Hutto He was Postmaster for over 4 years. In 1896 he bought an interest in Brother George's Drugstore. In 1898 he ran for County Tax Assessor of Williamson County, he "won the popular vote but got chiseled out of the position in the county convention". He bought back into brother George's Drugstore and in the fall of 1898 . In the fall of 1899 his health failed him again and he sold the Drugstore. He then bought an interest in A. L. Kimmons Apairy at Coupland and moved to Coupland. (Abraham Lincoln Kimmons was his wife's brother). In that summer he sold his interest back to A.L.Kimmons and moved back to Hutto, going to work for Landa. Co., locally. Worked for him until 1902, when he bought the "Hutto Enterprise", plant and all and ran the paper for about one year. He sold it and went back to work for Mr. Landa until early summer of 1903 when he had to take back the paper and plant. He ran it for about eight months, leased it and ran for County Clerk. He was elected and took charge December 1, 1903. He voluntarily relinquished the office in 1912, he remained in Georgetown through 1913 spending most of his time at the farm. He moved to Hutto in 1914 and lived there until May 1918, In February 1918 he went to work in the Tax Collector's office in Georgetown and moved back to Georgetown. In May of 1919, he moved to Corpus Christi. He, his brothers Charles and John and sister Margaret had bought farms when the Taft Ranch was divided and sold. After the September 14th storm he moved back to Hutto, where he served as Mayor for 2 or 3 years. He moved to Austin in 1923. He stayed in Taft all that fall and winter while building a house in town . He moved his family to Taft in 1924. He moved back to Austin where he stayed until his death in 1930. Joe Flinn graduated from the University of Memphis Medical School. His diploma hangs in the little museum in Hutto Also, a letter from a Doctor in Mexico, is also there. It was found in the wall behind where he had his office above Ray's Drugstore which was in the building on the west side of main street and Highway 79. The letter is evidently from a classmate responding to an expression of interest by Joe about Medical opportunities there. Joe Flinn delivered me and many others I have since met. He had a reputation for have a sure cure for pneumonia. Hugh Davenport, who compiled the book on the history of Hutto told of Dr. Flinn answering a call at Hugh's house to find a case of pneumonia. He immediately opened the window wide and put a wet bed sheet over a chair in front of the window. It worked. I often wondered if he got that from his father who attend the sick and wounded at Shiloh. It was discovered during that war of Northern Aggression that the ones who contracted pneumonia were the ones who got overheated, not the ones exposed to the cold and wet. Uncle Joe was always good for ice cream when he heard I was downstairs in the drugstore. He came from town, once, to Mom Martin's farm to treat me for a severe sting or bite. He said it must have been "an asp". O.R. said he had a sharp temper and that he and Luther hated to tend his horses. Dad sold him a Ford to make calls. Dad said Uncle Joe would hit Brushy Creek at full speed and call Dad to come get @# car and bring his horse and buggy. Dad liked to hunt and fish. As a boy growing up in Hutto he used to fish with Sam Fisher, a black man, who taught Dad how to feel under the creek banks on Brushy Creek for cat fish and pull them out by their gills. He once got caught stealing peaches and was shot by the owner. A BB lodged near his spinal column and his Uncle Dr. Joe Flinn would not operate. He took the shot to his grave. Dad was sent to Coupland to stay with Uncle Abraham Lincoln Kimmons to recuperate.The same Uncle Joe taught him how to swim by throwing him in the San Garbiel river in Georgetown and telling him to sink or swim. Dad graduated from Georgetown High School in a class of seven boys and six girls. He bought himself a gold watch for a graduation present. On October 13, 1917 he joined the Army at Fort Sam Houston and was assigned to Company B., 23rd Engineers to June 22, 1919 when he was assigned to Headquarters Detachment Advance Section 505 APO 757 through September 16, 1918 then to Advance Section Headquarters Company to discharge on July 12, 1919. He made Private first class November 11, 1918 and Corporal on November 25, 1919. His record shows no engagements but he told me a German High Explosive shell hit a building across from his. He was ill with pneumonia in France, George Halden and old Austin friend said he was gassed. He was to have pneumonia twice more. He wrote frequently to his sister May Flinn. His letters make interesting reading. (There is also a letter from a French girl which I have yet to have translated). His last duty assignment was with the "moppers up" as they called themselves. It was the Rents, Requisitions and Claims Department at Headquarters SOS in Tours, France. The newspaper article said they were handling 6,000 claims a month. He had a garage and sold Fords. He sold Uncle Joe one to replace his buggy to make house calls. He once got a call from Uncle to "bring me my horse and buggy and come get this #@! car". He had hit Brushy creek on the fly and drowned out the car. We moved to Austin and Dad went to work for Walter Tips selling hardware, in particular Automotive Parts. Mother went to work for Scarbroughs. Dad had the central Texas Territory and we moved to Coleman, Texas which was centrally located. Later, he went to partnership with Rushing Wells and set up a parts department to complement their sales of Texaco gasoline, Firestone tires and garage services. The station's float in one of the town's parades was a Model T Ford Roadster for which they had paid $ 14,00, painted green for Amos and Andy's Fresh Air Taxi. Dad in blackface, with a derby hat was Andy and Rushing was Amos. Dad loved automobiles and it seem as if we had a new one every year. We once had a Huppmobile with a rumble seat. A dusty ride on then graveled highways. We had Model A Fords and Chevrolets. Dad would spend his time off working on then. He also loved golf and tinkered with his clubs. I remember one, a spoon which he had cut in half and bent the brass up over the cut. He would practice chipping in the yard. Once he asked me to move far over to the side of the yard, "out of the way" and promptly chipped one to the side of my head! He enjoyed photography and developed his own films. He was an avid reader and enjoyed listening to the radio. Our first was a crystal set with ear phones. He would take one and give me on and with our heads together we would listen to Amos and Andy. He would take me hunting and fishing. He was very patient. Once when I fired into a raft of Ducks with my 22 and scattered them before any one else had a shot, he agreed with another hunter across the lake that he should "take that kid home" and we left. He had time for his family. He would bring home penny mints (now $1.00 a roll) hidden in his vest pockets for sister Ann to find. It was not uncommon for mother to come into the living room and find Dad an I in a rubber gun fight behind overturned furniture. We had two grocery bags of fireworks one July 4. His one bad habit was nicotine addiction. He smoked Prince Albert pipe tobacco in wheat straw paper. One before he got out of bed and one after he went to bed. He died with what the Doctor said was double pneumonia (third time) but I wonder if it were not lung cancer. What a short life!